This map highlights grocery and convenience stores, restaurants and fast food establishments, community and school gardens, meat processing and packaging facilities, and food pantries. This map also identifies some edible fruit and nut trees such as mulberries, peaches, apples, and black walnuts, as well as community assets—The Camp Washington Urban Farm, the Salt Dome, community centers, and cultural and artistic centers (The Swing House, Wave Pool, and the American Sign Museum). The creation of this map and the Camp Washington Art and Mobile Produce (CAMP) cart was made possible by funding from the City of Cincinnati Managers Office as part of the Engage Cincy Grants. This map was inspired and created by conversations with Covington’s residents. The Center for Great Neighborhoods hosted a series of Food Mapping Workshops and community dialogue events to assess our needs and assets, and dream of what Covington may become. This map was funded by a Kresge Foundation Fresh-Lo Grant and was made possible by all of the residences who participated in our workshops, conversations, and events. Thank you to our workshop hosts: Covington Coffee, Gutierrez Deli, Linden Grove Cemetery and Arboretum, and Pique. This Food Map invites you to explore the neighborhood of Northside in Cincinnati, Ohio. Take a walk on the wild side and raise your food consciousness as you realize the true amount of harvestable food that grows in our public domain. This maps was funded by primarily by Urban Artifact, with additional financial support from Shake It Records, Central Ohio River Valley Local Food Guide, CAIN, Green Umbrella, Northside Village Green, Groundwork Cincinnati, Cincinnati Permaculture Institute, and Cincinnati State Community and Technical College. This Madisonville Food Asset Map has three layers of information: 1. Brick and mortar stores (i.e. restaurants) and support centers (child and health care, fitness etc. ); 2. Sidestreams 500 Gardens Locations, and 3: Wild Edibles (fruit and nut trees). 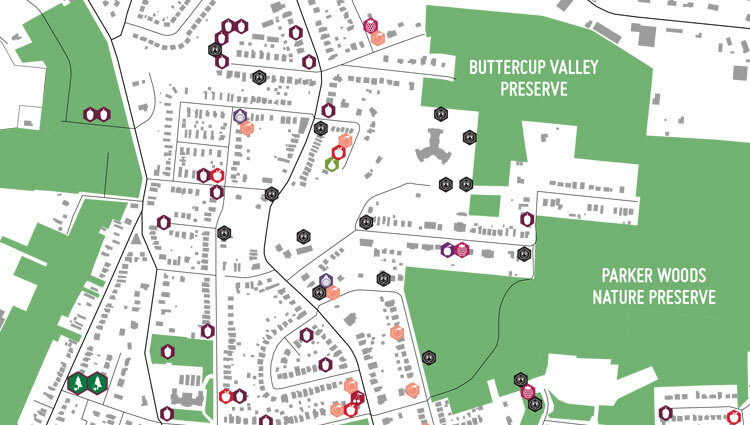 This map is a collaboration between Indian Hill High School, the Madisonville Community, Slow Food Cincinnati, and Cincinnati State’s Landscape Horticulture Technologies Division. Special Thanks to our community partners: Madisonville Education and Assistance Center (MEAC), SideStreams, Madisonville Community Council, and Madisonville Community Urban Redevelopment Corporation (MCURC).